All roads lead to food (and love!). For hundreds of years generations of mother's and daughters have shared the secret to a man's heart — food, of course! And, we can't agree anymore, so we are bringing you five of our favorite celebrity couples who rave about cooking for each other! Which of these couples (or ex-couples) surprises you the most? 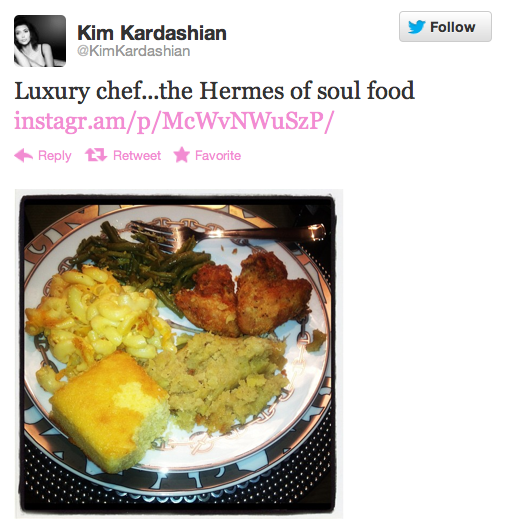 The famous Kardashian sister tweeted a photo of a plate of what she considered "soul food." It consisted of fried chicken, cornbread and macaroni and cheese that she claimed to have cooked for boyfriend Kanye West. The caption? "Cooking some soul food for my baby! Luxury chef ... the Hermes of soul food." Surprisingly enough, it seems that Kardashian does actually enjoy cooking and is pretty good at it. Back when she dated football player Reggie Bush, he raved about it too! "She’s the first girl that’s ever cooked a meal for me," Bush told OK!magazine. "That’s honestly how she got me — with the food! She cooked one of my favorite meals, corn bread, macaroni and cheese, candy yams and fried chicken, and it was ridiculously good. I was already stunned by how beautiful she is and then when she cooked the meal for me. And she’s pretty too, it’s done. You can’t ask for much more." Hmm, we see a pattern here. Aww, we can imagine that Mike Fisher doesn't mind watching the stunning singer try, regardless of what the food tastes like! Biebs dished about then girlfriend Selena Gomez's skills in the kitchen: [Selena] can cook very well. She does some wonderful potatoes with cheese!" Hmm, starting at a young age. We like, we like. Kim may cook soul food for every boyfriend, but it doesn't compare to what sister Khloe Kardashian admitted to doing back when she was married to Lamar Odom. When Cosmopolitan magazine asked her if she strips or cooks for her man, she replied with a response we're sure would work for any man. "Both, together!," she said. "I cook for him naked!" So basically, Kim needs to step it up. Yeees, Khloe — keep things hot in the kitchen and the bedroom. No Doubt singer Gwen Stefani is known for her killer voice and killer abs. So, if she eats carbs for husband Gavin Rossdale, it's surely true love. "I’m conscious of what I eat, but some days I cave and have cookies," Stefani admits to Instyle magazine. "On fun nights with the family, my husband cooks amazing things and there will be carbs."